When I was about four, I was convinced that garbage collector was the best job in the world. They got to ride on that little platform on the back of the garbage truck! How much fun would that be??!! Oodles and oodles of fun, I was sure of it. I wished nothing more than being allowed to ride with them one day. Sadly, that has never happened. I'm still waiting. Yes, I wanted to be a singer when I was about 8 I think. There used to be dozens of tapes with my sister's and my efforts, but luckily, they didn't survive. The only concern I had? That none of the singers I admired seemed to have scabbed knees, and I always did (we played outside every day). I never seriously thought I would wear pants on stage, so I tried my hardest to not get new bruises or scabs for a while. I didn't succeed, and my dream died little by little with every new scratch and wound I got. Do you love the circus? I was obsessed as a child and teenager. 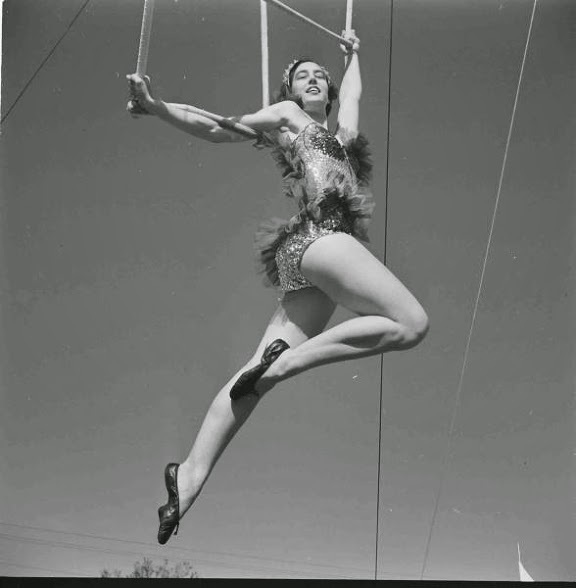 While I didn't care much for the clowns and felt sorry for the animals, I adored the trapeze artists. They looked so elegant and glamorous! And how amazing was it what they could do?? They flew through the air, did the most breathtaking performances with seemingly no effort, and wore those fabulous sparkly outfits. I wanted to be just like them! Needless to say, that dream never had even an ounce of a chance to become a reality. Yup, not a job. 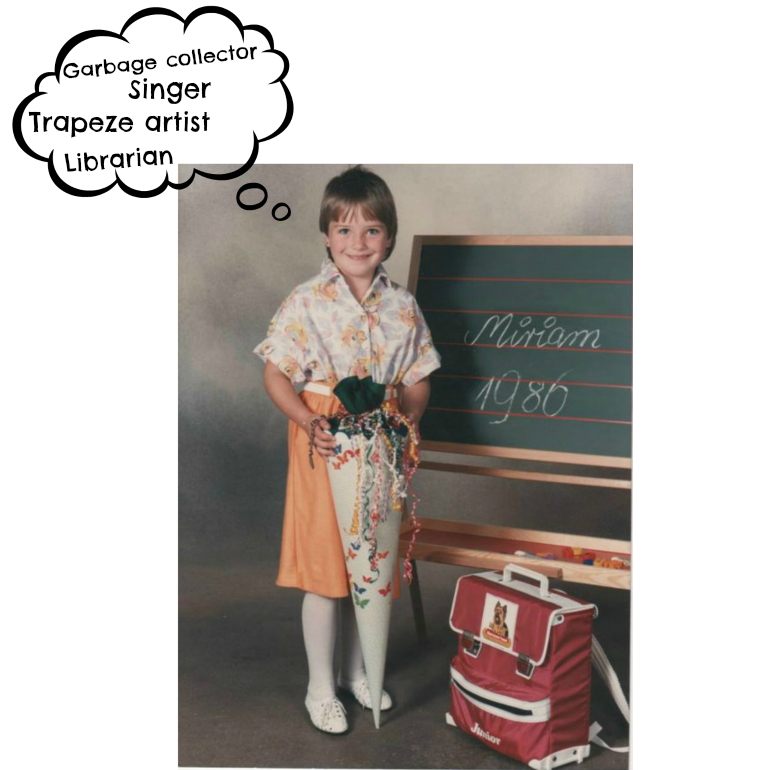 Once I was in high school, German (my native language) quickly became my favourite subject in school. I enjoyed writing essays, and I have always loved reading. One day our teacher mentioned a university course: "Germanistik", aka German studies. The Wikipedia definition is that German studies are "the field of humanities that researches, documents, and disseminates German language and literature in both its historic and present forms". I had no clue what sort of job one would do with that degree, but I didn't worry too much about it. It sounded intellectual, it had something to do with languages, and I decided that's what I wanted to study after high school. Well, that idea never amounted to anything either. I can't quite remember why I lost interest - maybe because I never did find out what job opportunities there were? Very briefly I also considered a career as a librarian, but was disheartened when I learnt how many books and authors you had to know. My memory is like a sieve, and I didn't think I could remember them all. That one I actually attempted, and I wrote a post about it last year. Suffice it to say, that didn't pan out either. But it got me to Canada where I found my husband, so it was all worth it. Today's prompt was: Dream job when you were little/what is it now? Ahh, I love this one! It was really fun to read about what held your career-path interest as you were growing up. And you're so right - still time to write books! Keep working toward that dream - it'll happen! Such a great prompt! I may actually do this one, but not as part of "Blogtober". I had so many changes of heart over the years...my interests stayed the same (animals, writing, kids, health) but I was trying too hard to channel it into a career. I wanted to be a vet for a while, a news correspondent, a teacher, a director, a writer...and unfortunately I went so far as to change my major in school several times as well! I was trying to match up my interests with careers too literally instead of just enjoying them as hobbies on the side. BUT I will be writing a post about it all so that's all I can say for now. Thanks for the inspiration! Well aren't you super ambitious! Garbage collector and Trapeze artist, too funny! I can relate to wanting to be a singer. I think these are some great jobs that you wanted to be. I also think being a writer is a great thing to aspire to. And you can do it. Cute young Miriam :) I think I had the same haircut at some point. What are holding in the picture? Garbage collector, that's an interesting one. I've never really known what I wanted to be. I think I always wanted adventure, explore somewhere new.